Mara has been missing for nearly a year, leaving only a few small possessions by the sea’s edge, and Caitríona is riven with anguished grief and bewilderment as she tries to unravel what happened and why. 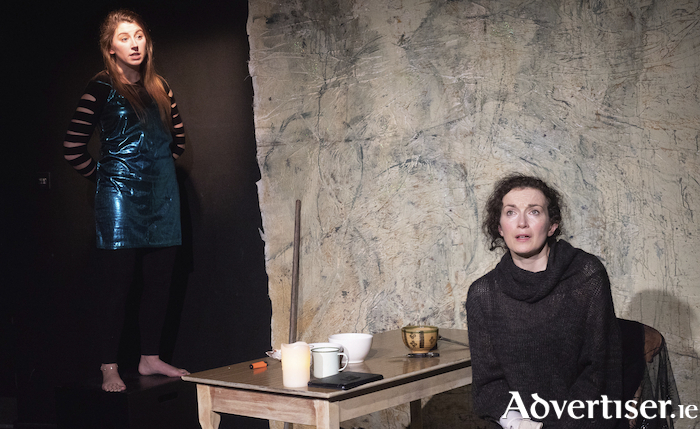 Much of this strand of the play is delivered as a monologue by Caitríona, addressing a photograph of her lost sister, though some flashback scenes re-create phone text conversations between the two women. While Mara spoke her half of these dialogues, Caitriona’s lines were delivered as recorded voice over, which struck me as an awkward device. The theme of female voicelessness spans both storylines in Wake. in both instances within the context of damaging relationships. As the mermaid, Orla Ní Thíobraide cannot get the love or acknowledgement she craves from the Prince, while her Mara is enmeshed in an affair with a married man which she is unable to discuss with her sister. Both male figures are portrayed by John Valters Paintner who appears sporadically as a silent, stern, presence. At times the script is overwritten, emotionally over-wrought and, as a whole, over-long. Sullivan admits in her programme note she is inexperienced as a dramatist, and passages of the play were more like chunks of prose or prose poetry than compelling stage language. The programme credits four different people as dramaturgs and one wonders if this was a case of too many cooks seasoning the broth. Wake certainly brings insight and empathy to its characters’ predicaments and pain, but the saturating dark tones of the story would have benefited from more contrast and variety. As director, Mairéad Folan got fine performances from her actors and the production was also well served by its designers – Dolores Lyne’s set featured a backdrop of weathered, sand-coloured parchment, and a suspended ship, while Blue Hanley’s lighting and Peter Mannion’s sound also enhanced the proceedings. While not everything in the show came together to maximum effect, Wake was a laudably ambitious production which countered the voicelessness of its female characters with the eloquence of its mostly female creators.